I ordered a Bulgogi burger set from Lotteria to go as I was rushing to catch the bus. I had my hands full because I had a suitcase and my backpack and I thought I would have to leave the drink behind but they taped the drink so it wouldn’t spill and sandwiched it in between the fries and bulgogi burger so it would stay upright. Other fast food chains would do well to follow Lotteria’s example. 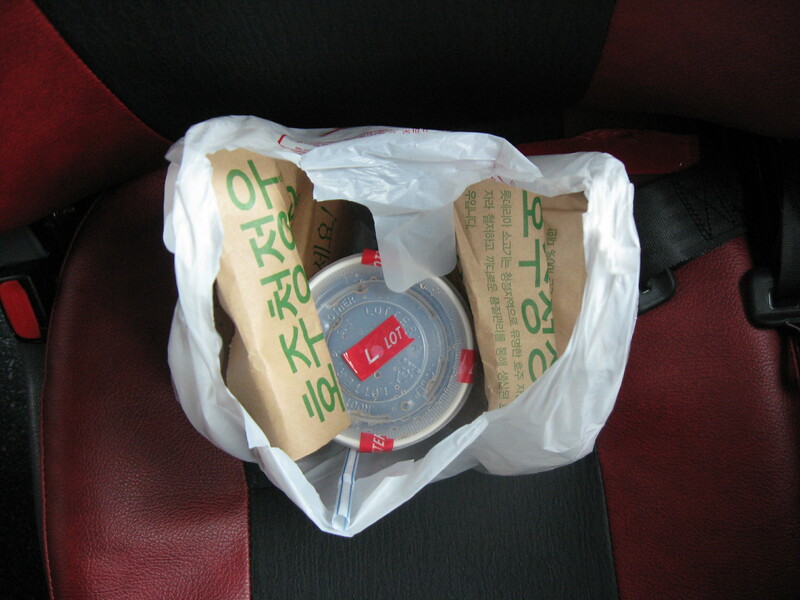 This entry was posted on diciembre 10, 2009 at 12:04 pm and is filed under Korea Photo. You can follow any responses to this entry through the RSS 2.0 feed. You can leave a response, or trackback from your own site.